It's official: everyone in the future will be made entirely out of carbon nanotubes. They may be able to cure cancer, they may be able to rewire our brains, they may be able to make synthetic skin. Basically, they may be able to replace an entire person. But once we've made all of these Carbon Nanotubians, what will they do all day? The answer has come at last: they'll take an elevator into space. One that's also made of carbon nanotubes. That elevator has been a gleam in an engineer's eye for over a hundred years, and now, thanks to carbon nanotubes, it has become, at the very least, a structural possibility. Until now, there wasn't a material strong enough to keep from collapsing under its own weight if it were built tall enough to reach up into space. Carbon nanotubes, tiny hollow tubes made of interlocked carbon molecules, are tough enough to meet the challenge. If they were woven together, a single strand the width of a thread could support a car. A large enough block of carbon nanotubles could form a 'thread' 22,000 miles long. The thread would be kept taut by Earth's gravity on one side and the centrifugal acceleration of a Nasa refueling station/touristy snack bar and souvenir stand on the other. Between them an elevator would creep up the length of the carbon nanotube thread, carrying supplies and passengers. Nasa has 3 million dollars worth of faith in the idea, which given the recent budget cuts has to mean a lot. Three million dollars of exploratory and scale model money isn't going to get this done, though. Give this to Abu Dhabi. 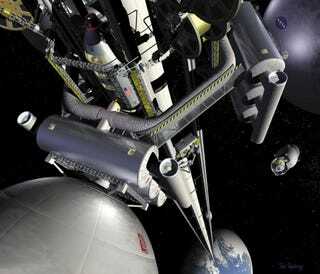 They'll have a space elevator knocked out by the end of 2011.